I hope everyone had a delightful Thanksgiving full of yummy food, great family time, and successful shopping! My Thanksgiving was all of the above, so it was nothing short of wonderful! We had an early dinner with my hubby's family and then a late dinner with mine. It was a wonderful time, but I couldn't eat another crumb of food after the day was over! 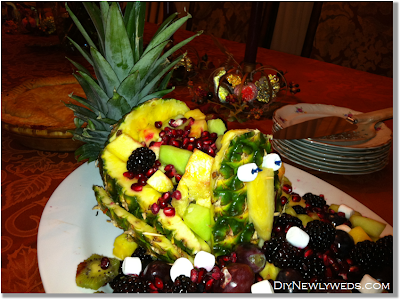 Although I didn't host Thanksgiving, I brought a few dishes to each meal including my famous Turkey shaped fruit salad made from a pineapple. I posted a tutorial about it last year, but I changed it up a little this year and will update the tutorial (eventually). 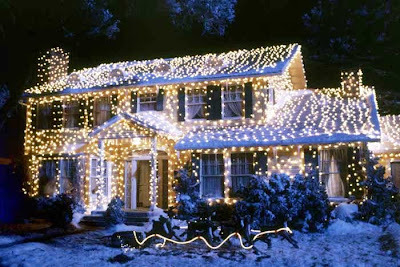 Now that Thanksgiving is over and December is only a few short days away, I can start decorating for the holidays. I plan on sharing some fun Christmas and holiday projects over the next month, but I'm always looking for more ideas. If you have a holiday craft or DIY project you'd like to share, please send it over and I will feature it here next month! And if you have an Etsy shop, or would like to advertise any other product/service/blog here, check out my holiday advertising specials! Even though I'm not hosting Thanksgiving at my house, I still wanted to spice up my dining room centerpiece for the Fall. I usually keep some simple white candles on a red tray and accessorize the tray for the season. 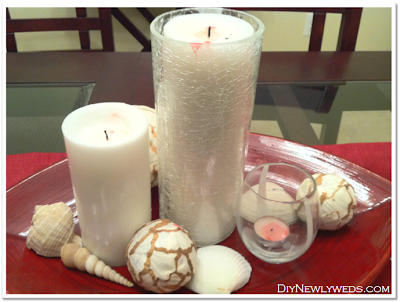 For the summer, I decorate my candle centerpiece with shells. 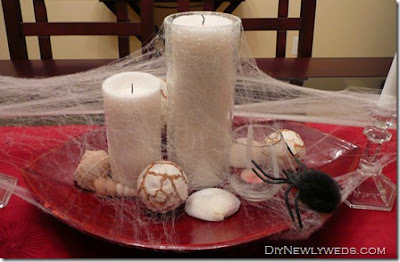 For Halloween, I kept the centerpiece the same but added some ghoulish cobwebs. For Autumn and Thanksgiving, I decided to take a more natural (and less supernatural) approach to my dining room table decor. 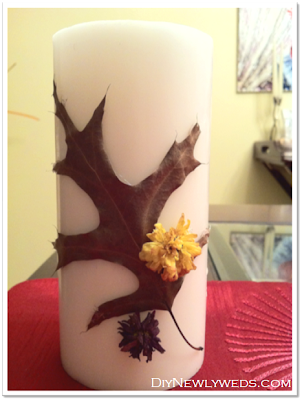 I collected some oak and maple tree leaves from my front yard and cut a few blooming mum buds to decorate my candles. 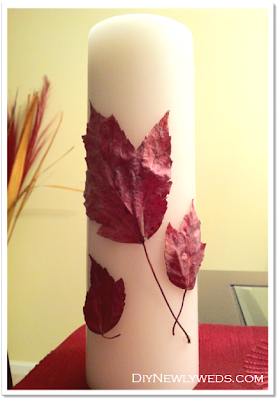 I hot glued some pretty red maple tree leaves to decorate my first candle. I love the naturally bright red color of these beautiful leaves. 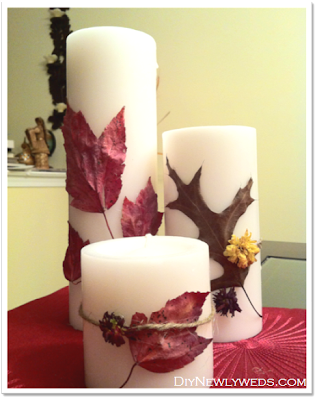 On the next candle, I glued a nicely shaped oak leaf and then added blooming buds from my yellow and red mums for some color. The mums are holding up well and continue to look pretty as they dry. 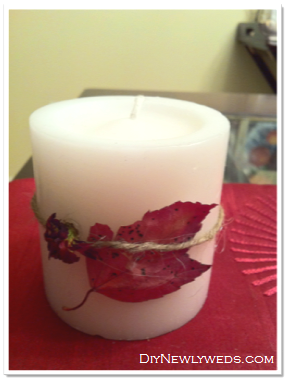 On the last candle, I added another maple leaf and mum clipping and tied a simple piece of twine around the candle. 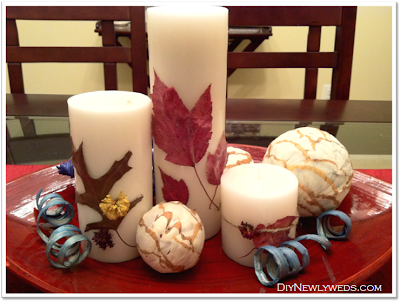 Despite being very simple and quick to make, the candles add a nice Autumn touch. I placed my DIY candles back on the red tray and replaced my summer shells with some decorative balls and blue spiraly things. My new dining room centerpiece adds a perfect touch of fall to the room! If you're anything like me and love a good bargain, you're probably looking forward to Black Friday like I am. Last year, I braved the crowds and went shopping at about 5 am. It was a crazy experience, but I actually had a great time! But if waking up before the sun and large crowds aren't your cup of tea, I recommend checking out online sample sites to score bargains in the comfort of your own home. These sites host different online sample sales every few days offering home decor, clothing, accessories, local deals, and even vacations at big discounts. To share the bargain love, I created a handy dandy new "Deals & Steals" page which lists some of my favorite online sample sale sites. Just click on the "Deals & Steals" button at the top of my site to access! I'm back! If you noticed that I've been MIA recently, it's because I had to hit the road again (actually the skies) for another work trip. Last week I headed to the Windy City, Chicago. This was my first time in Chicago and it is a beautiful city. I was amazed by the skyscrapers and the magnitude of all of the buildings. I've never seen so many skyscrapers in one place, even compared to the Philadelphia and New York skylines which I'm more accustomed to seeing. I didn't have too much time for sightseeing during my trip, but after a few slices of deep dish pizza I squeezed in a visit to Millennium Park. The park is a beautiful area in downtown Chicago which features some very cool architecture and public art in addition to the parkland. Chicago has a lot of modern architecture including the Jay Pritzker Pavilion, an outdoor concert venue, designed by famous architect Frank Gehry. Nearby is the Cloud Gate sculpture which is better known as "The Bean." The Bean is a very cool modern sculpture by Anish Kapoor, a British sculptor. It is constructed from super polished stainless steel which is made to look like liquid mercury and reflect images of the surrounding buildings and blue sky. If you look closely below, you can even see my reflection in the Bean! I had a great time in Chicago, but there is so much I didn't have a chance to see. Have you visited the Windy City? What should I check out next time I'm there?